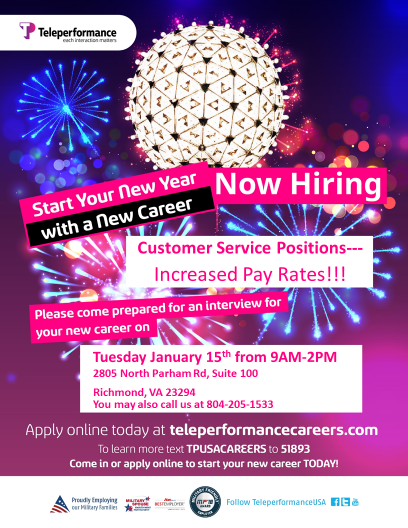 Teleperformance Richmond is excited to announce that we will be kicking of the new year with an Open House on 1/15/2019...with over 300 Full Time positions available for the new year. New Year New You New Career!! So why not celebrate the new year with a new career and visit us for our Open House on Tuesday, January 15th, 2019 from 9:00 AM to 2:00 PM. Cheers to a New Career! !